The new Casio® PRIZM FX-CG10 features smooth lines and 3.17" color LCD screen similar to smart phones, mp3 players, and other handheld device students use every day. The high-resolution, vibrant color LCD displays graphs and statistical data exactly the way they would appear in textbooks. New Color-Link technology allows students to manually assign data to a specific color as in the example below. 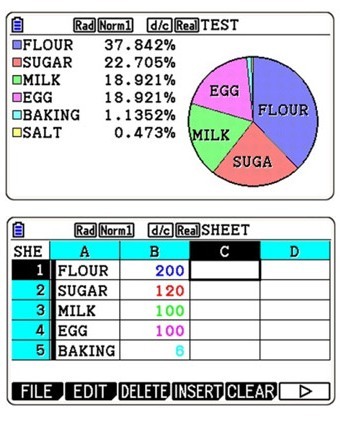 Students can designate each ingredient a color, then easily visualize what percentage of the recipe each ingredient comprises in a full color pie graph. • Features a blue outer shell for identification in the classroom. Easily see which calculators belong to your collection. 7.42" x 3.52" x 0.81"